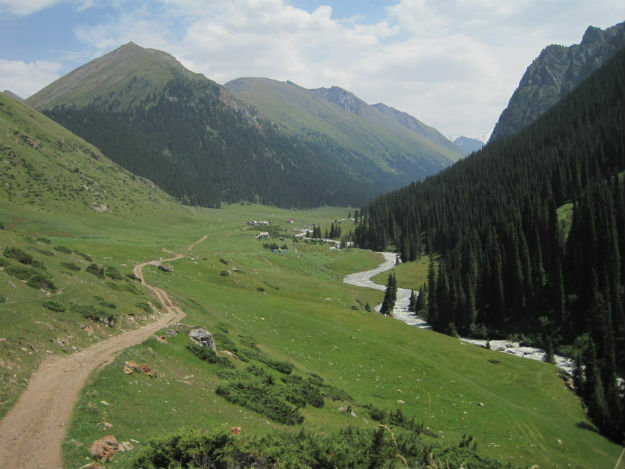 Without much argument the main attraction of Kyrgyzstan is Lake Issyk Kul and the hiking opportunities in the area. (My main attraction is hanging out at the retro roller skating rink in Bishkek, but that’s just me.) Issyk Kul is said to be the second highest alpine lake in the world after Lake Titicaca in Bolivia. Years from now when I am sleeping under a bridge I will impress my fellow homeless by saying I have been to both, but where is the top 10 list? I can’t find it on Google. 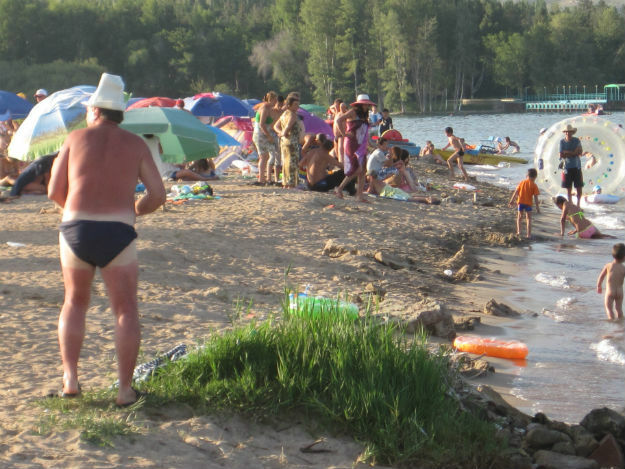 A Russian wearing a traditional Kyrgyz hat, a kalpak, getting a bit burnt in Cholpon Ata on the north coast. That’s going to hurt tomorrow. 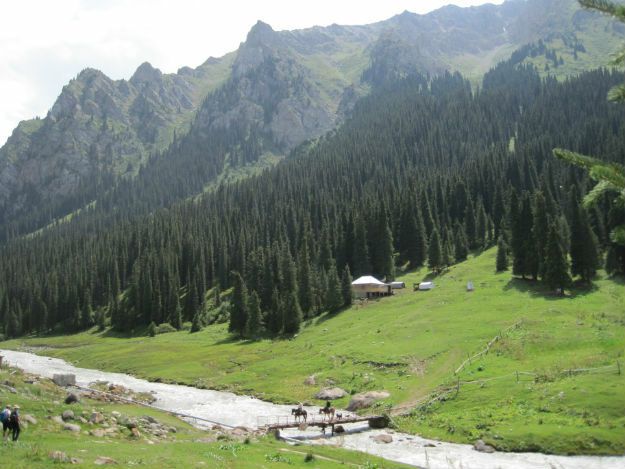 I did a short trek into the mountains southeast of Karakol from Ak-Suu Sanatorium up to Altyn Arashan, about four hours and 700 meters uphill to a pretty valley below next to a rushing river. (All water rushes in Kyrgyzstan, even the sewers in downtown Bishkek.) It’s a beautiful route, but hiking is too solitary an exercise for me. I’m already alone most of the time; I don’t need to heighten the sensation of being isolated. I was thinking this after I had reached the valley, wondering if I should head back down, but then an hour later I was lounging in a hot springs with two fit birds from England (I love that expression) and wondering why I don’t go hiking more often. I’d prefer to go hiking with someone, but it’s like tennis: if your partner isn’t at a similar level, it’s a drag. This couple runs the second place you come to in the valley, Arashan Travel. If you didn’t bring your tent, it is 300 som ($6) for a bed, 200 som ($4) to use the hot springs (I prefer room 3), and 100 som for breakfast. Karakol disappointed me. I had higher hopes, but it is a dusty, sleepy town. Maybe my boredom heightened the excitement to find Karakol Cafe, because I don’t even drink coffee. I poked my head inside and it felt like I was in an American college town full of short-haired, fair-skinned people with their heads down in their laptops. 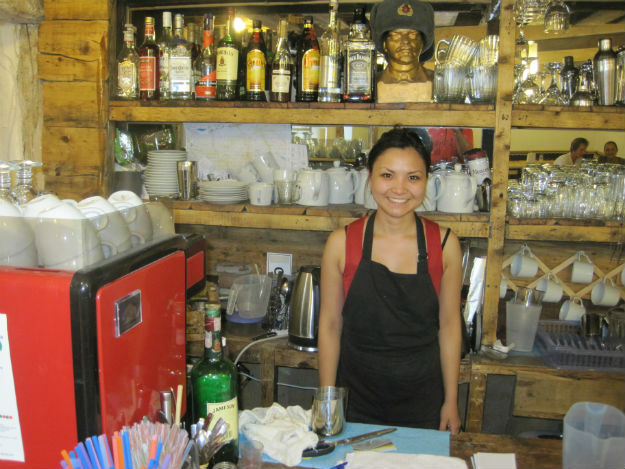 The excitement emanated from hearing the story of how the cafe came to be from the plucky young owner, Aikerim, who regaled me with stories of corruption, bureaucracy and the pitfalls of starting a business in Kyrgyzstan. I love that stuff, even more when there is a happy ending. It is a testament to her strength and perseverance that it has taken off and deservedly so. I may be the last to discover this, but one of the secrets to business success anywhere is free wifi, pure and simple. Wifi is the travelers’ crack of the early 21st century without a doubt. If you have strong wifi, travelers will put up with absolutely anything. They will stay or eat in the worst hovel with wifi rather than a great place without it. 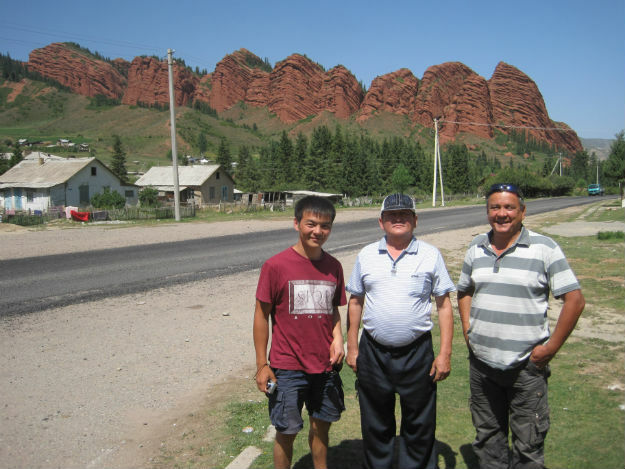 I tried a little hitchhiking from Karakol heading west to Jeti Oghuz, and got very lucky when these geologists picked me up to see these red rocks. Hitchhiking back from Jeti Oghuz, a Russian picked me up who had worked in Silicon Valley as a programmer and said that it must be strange for me to travel halfway around the world and see landscapes like in California. He’s right. California has everything. I should go home. I’m tired. I miss my mommy. 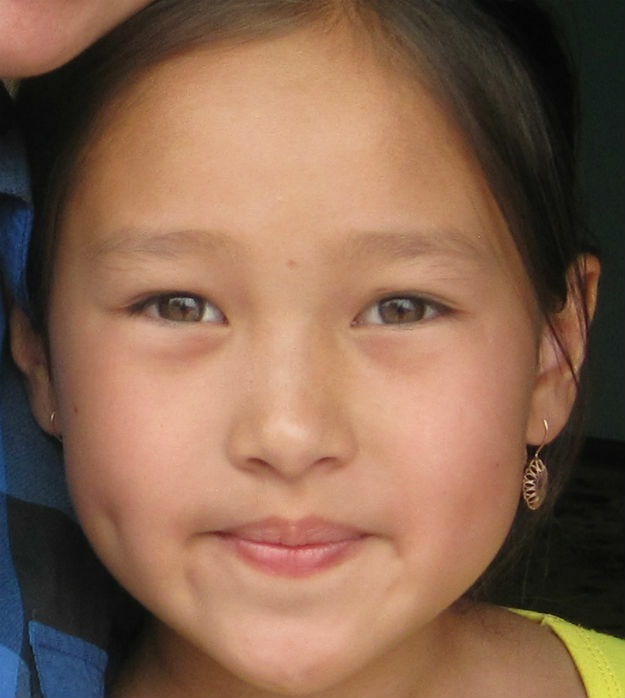 The accommodation deal of the Kyrgyz century is Park Hotel in Karakol. 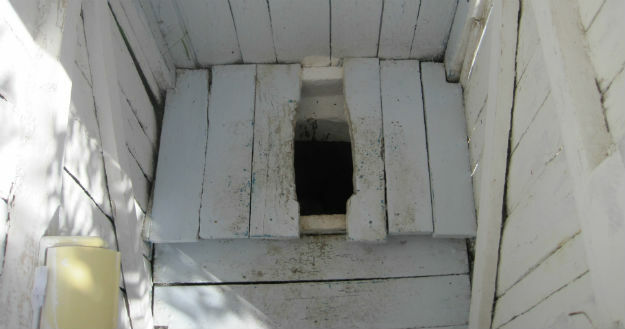 I had stayed at Pegasus Guest House in Cholpon Ata, paying 400 som ($8) for a dorm bed, the toilet being a literal outhouse as you can see in this photo, but in Karakol through word of mouth I found Park Hotel, only blocks away from the middle of town, 600 som ($12) for my own room in a clean modern new building. I can’t stress enough how much of a good deal it is. Let me repeat that again: Park Hotel is the accommodation deal of the Kyrgyz century. Get room 1 as the wifi in the lobby baaarely reaches there. Let me guess, the Red Russian had fat knees in the frontal view photos and didn’t want them posted? Next time you’re in Bishkek me/you/Maki can go hiking and all walk the same speed. It’ll be fun! No, I’m just saying that I must have been like a ball and chain for you, though I wasn’t holding you back much either, I hope. Is “Navigable” the operative word? I was like a paparazzi trying to get the best pic of him!